What do people say about MM? What do people say about Geert? What does MM say about...? We send out a special Master Morya message every month. This "Mayil eNews" is sent by email to those who are interested. Please subscribe here to receive it too! Last month, I participated in a gathering of one of the dozen or so Morya groups that exist in Belgium. This particular group is quite large and consists of about 12 people who, for several years now, have been meeting regularly to study Master Morya’s texts and workbooks together. For me it was an absolute revelation to be there. (...) Want to read more? Please subscribe to read the rest of this newsletter! “Time and time again a joy comes to the one who dares to live with joy. It isn't necessary to be really joyful in order to live with joy, for joy is something you can learn to accept, it's simply there. When you allow joy into your heart, when you accept joy within yourself, then it is there. Even though you may be in the most difficult and painful situation, if you concentrate upon the joy that is there, then you can experience it. It's good to do this every now and again: to be able to see and find this joy within yourself. It's there, and when you begin to experience it, when you learn to discover it within yourself, then you know that it can always be there. By this you raise your consciousness, you enter into the joy of life and learn how to live with this joy. It calls for courage to be joyful, because sometimes you can’t see any reason to be joyful. (...) Want to read more? Please subscribe to read the rest of this newsletter! What does Master Morya say about himself? What do other people have to say about how they experience Master Morya? What does Master Morya say about all kinds of interesting subjects? Who was Geert Crevits and what precisely was that telepathic contact? What books are now available in English? What activities are being organized and how to contact us? Etc. 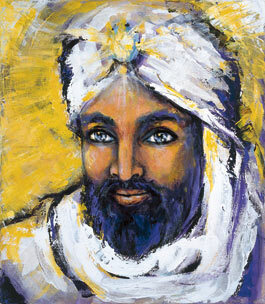 Would you like more people to become acquainted with the teachings of Master Morya? Then please make a donation to let us grow. © The image of Master Morya, the symbol and all the texts are under copyright of Mayil vzw / www.morya.org. Please contact us if you would like to make use of any texts or images!